M/s. 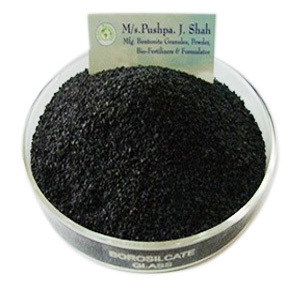 Pushpa J Shah is bulk manufacturer of Roasted Bentonite Granules located at GIDC Panoli Ankleshwar, Gujarat. These granules are made of pure stone free Bentonite Clay which is roasted at 700 degrees temperature. At this temperature granules become calcined, inert & sterile and thereby widely used as carrier in formulation of pesticides, herbicides, fungicides, bio-pesticides and Bio-fertilizes (Mycorrhiza). Roasted granular products have wide acceptance among growers. 1/ It remains free flowing after absorbing 20 % liquid thereby can be formulated at higher concentration of technical. 2/ As the granules comes in contact with water, it releases the active ingredients slowly over a long period of time hence reducing the chances of wash out in heavy rain or water logging condition. 3/ Acts as a preservative of active ingredients. It saves the technical ingredient from the direct ultraviolet rays of sun. 4/ It is inert therefore does not react with the technical ingredient and increases shelf life. 5/ Due to its hardness and high absorbent capacity, while formulation it does not stick to the wall of granulator or form cakes. 6/ As it is in granular & dust free formulation, therefore it prevents the farmer from toxicity effect by inhalation of dust particles. 7/ Due to high porosity & liquid holding capacity these granules show encapsulation properties.